We are an Early Childhood Learning School. Our mission is big, but it is clear; to change the trajectory of the world, one child at a time. This takes passionate people, ready to roll up their sleeves. it takes driven educators who truly want to make a difference. It takes visionary leaders, dedicated to the long view. Come join the First Light team and let your light shine! Full-Time and Part-Time Teach Assistants - helping to implement classroom management, lesson planning, cleanliness, and daily duties to assist the teacher. Full time and part time positions are available. Toddler Teacher - One year commitment, full-time, year round position leading a classroom and assistant(s). 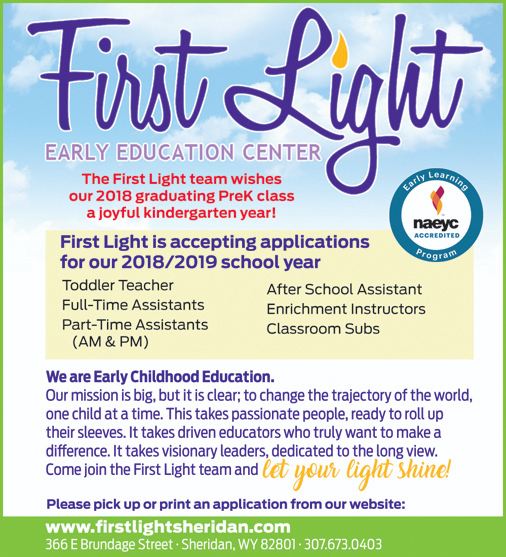 The teacher will exemplify First Light's values, professionalism, implementing the daily routine, lesson plans, small group activities, and modeling problem-solving steps to nurture the love of learning in each child. Infant/Toddler Caregiver - to help infant/toddlers thrive, physically, emotionally, socially, and intellectually. Click here for more information. Custodian Deep Cleaner/Weekly Sub Cleaner - deep clean one weekend day approximately 5 hours and sub as needed when available. Click here for more information. 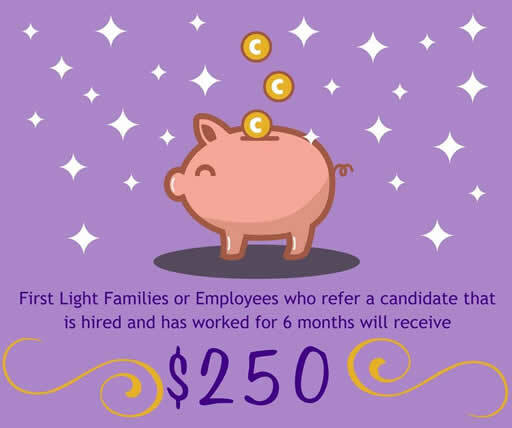 First Light has a team of college students whose schedules change each semester, therefore, we are typically hiring Aug/Sept, Dec/Jan and May/June and accept applications year round to not miss potential candidates that seek to provide excellent care and love to our little ones. Professional Development monthly and ongoing continuing education opportunities. 2. Drop off the completed application in person at 366 E. Brundage St., (across from the M&M Center).